Cole Dannewitz co-founded Vacations By Rail in 2004, playing a key role in growing the company to one of the United States’ largest producers of rail vacations and train tours to destinations around the globe. In 2011, he and his business partner expanded overseas with the launch of the company’s international subsidiary, Holidays By Rail Limited. Dannewitz was integral to the success of this venture, overseeing its launch, management, and day-to-day activities. Dannewitz developed an affinity for train travel while visiting family in Stuttgart, Germany, as a young adult. Since then, he has traveled extensively by train throughout Europe, Japan, Canada and the USA. His bucket list rail journey is the Trans-Siberian Railway aboard the luxurious Golden Eagle train. Dannewitz is responsible for Vacations By Rail’s and Holidays By Rail’s interactive media strategy technological agenda, identifying new digital marketing opportunities and multi-platform digital performance. In addition, he is integral in introducing new software and technology enhancements to increase user experience, product accessibility and online security. 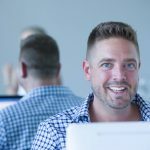 Prior to starting Vacations By Rail, he held management positions at Deutsches Reisebüro GmbH (DER), TribeAgency, and Rail Europe, where he oversaw the companies’ online presence and web site development. Travel Research Online (TRO): You seem to have enjoyed trains since an early age and traveled quite extensively on them. What do you think the traveler gets out of traveling by train, that they don’t get from air travel? Cole Dannewitz (CD): The beauty of a rail vacation is, in many cases, it begins the minute you step aboard the train making the journey itself just as important as the destination. In the case of long-distance train travel—across America’s West, across Canada—the train isn’t just a form of transportation. It’s the hotel, it’s the restaurant, and it’s the perfect spot to check out scenery you can’t see from any other mode of transportation. Travelers also get the gift of time when traveling by train. Quiet time to relax, quality time with family, and time to appreciate part of the world they can’t see from 30,000 feet in the air. TRO: You cofounded Vacations By Rail in 2004. What would you say was your driving motivation to start the company? CD: Having worked in the rail industry for years, I was familiar with the challenges of piecing together a rail trip, even within Europe whose combined rail systems are very interconnected, let alone in places where rail travel is not as common or popular. It was difficult to plan a rail vacation because information was segmented and no one company specialized in rail travel around the world. TRO: Train travel in the US seems to be on the decline over the years. How do you think you, and others in the travel industry, can help renew this amazing way of travel? CD: There’s a misconception that rail travel is on the decline in North America. In terms of ridership, rail travel has increased over the years, especially in North America. Amtrak and VIA Rail have both reported year over year ridership increases. This is due partly to an increase in riders on corridor services, but rail travel as a vacation option is also increasing. People are realizing it is a less stressful way to travel. No airport hassles, no long check-in lines, no strict security measures (travel by train and your full water bottle is welcome as is more than 3 ounces of anything from contact solution to shampoo), and no cramped seats. Travelers are even encouraged to get up and move around during travel as opposed to staying buckled in their seat. Travelers are embracing these aspects of traveling by train. TRO: With your opening of Holidays By Rail Limited in 2011, you opened up a massive market for your company. How has this changed your approach to selling train travel? CD: We quickly realized what works for one market does not necessarily work in another. Many aspects are different, from how we reach customers to product offerings and promotions. We try and tailor the approach to individual markets. TRO: How does Vacations By Rail work with agents to help supply travelers with getaways and tours that are train-based? CD: Vacations By Rail offers travel agents up to 15% commission and provides a one stop shop for all of their clients’ rail needs. Our rail specialists offer unbiased advice and trip options based on the type of rail travel experience an agent’s clients want to have: a classic overnight rail trip, all-daylight train travel aboard scenic heritage railways, scenic excursions across Switzerland, point-to-point rail experiences aboard Europe’s premier high-speed trains as part of a larger Europe vacation, or a luxury rail experience to destinations around the globe. TRO: You seem to try and keep your finger on the pulse of new technologies and services to help your company grow. What technologies does Vacations By Rails offer agents in the way of booking? CD: Agents can make, review and pay for their client’s reservations online. We also offer an affiliate program for agents that want to link from their website. If an agency wants to incorporate our content into their own reservation system we will provide an XML feed for them to easily do so. TRO: Does Vacations By Rail, or Holidays By Rail Limited, have any big news for the near future that we should know about? CD: Vacations By Rail is launching a new website that will include an agent portal. The portal will allow travel agents to service their reservations more efficiently as well as offer travel agents on-demand training, education tools and marketing support. Overseas, Holidays By Rail was recently nominated for a British Travel Award in the category of Best Rail Holidays Company. We’ve been nominated every year since 2012 and have taken home four trophies.